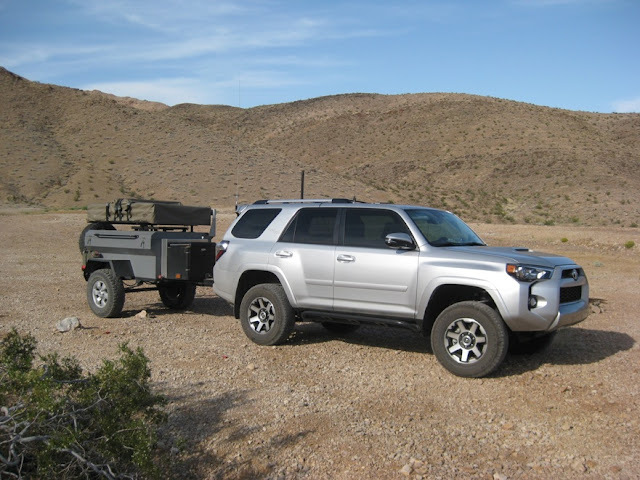 Owning all of the fanciest off-road or back country gear in the world may not save someone from a death due to a treatable injury. No one wants to be faced with asking themselves why they stood by helplessly watching someone suffer during a backwoods emergency. 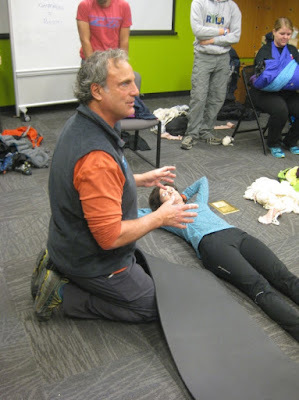 Wilderness First Aid (WFA) skills can apply in any location whether back country or during an earthquake because we may have to wait hours for help from EMTs or Paramedics. I took the first step to improving my skills and signed up for the excellent Wilderness Medical Institute course offered under the umbrella of the National Outdoor Leadership School, or NOLS. Successful completion of the course earns you the WMI certification for WFA which also includes meeting the training standards for administering EPIPens (epinephrine auto-injectors) in California. Next year I plan to build on these WFA skills by taking the 10 day Wilderness EMT course. 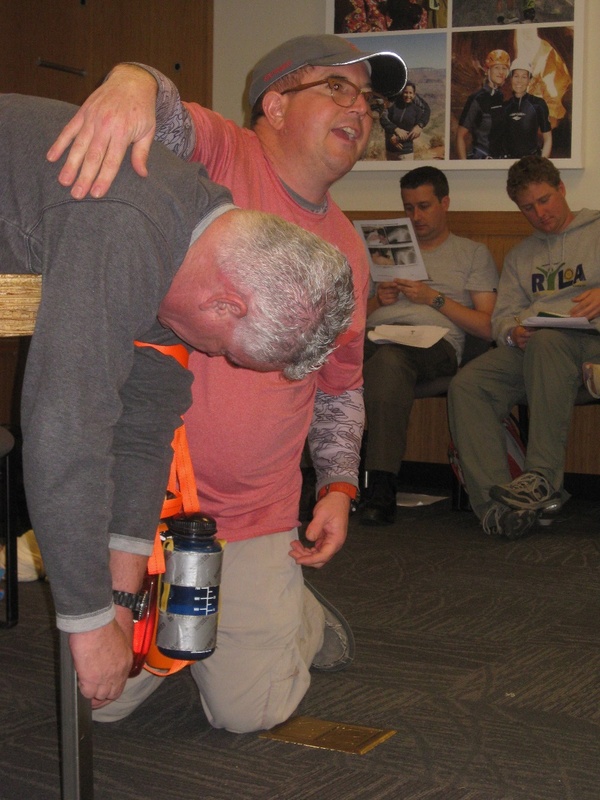 Learn how to administer first aid in a wilderness context. What sorts of instructors do they offer to guide you through the topics? The best! 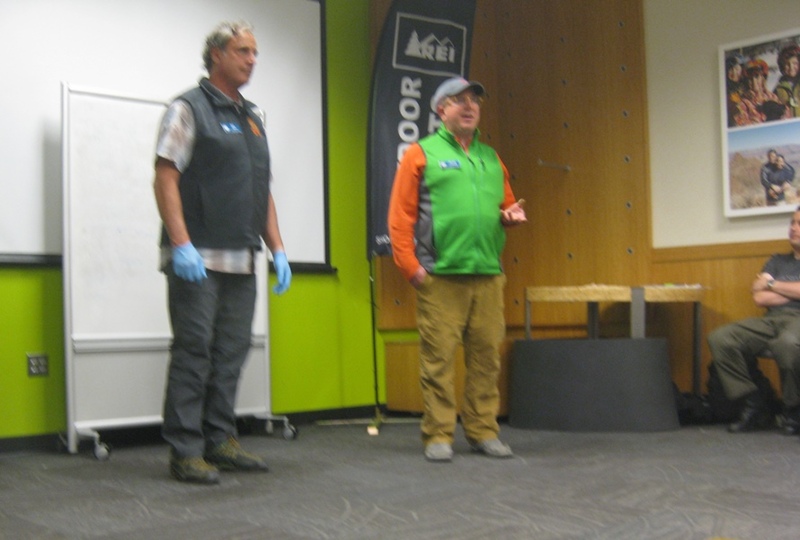 Danny is a 25 year EMT veteran, Dan brings 30 years of Paramedic experience and both are skilled outdoorsmen. They worked as a very effective team to provide spirited lectures, hands-on practice with medical supplies, solutions improvised from materials on hand and numerous medical emergency scenarios that students had to resolve.. The two days were jam packed to say the least yet the pace was perfect. It helps that everyone attending was keenly interested in leaving the class with a good handle on the course material. Unlike public schools, no one sat in the back hoping to get by unnoticed. Everyone took a turn at playing the role of the patient within the context of providing rescuers with a valid learning scenario. 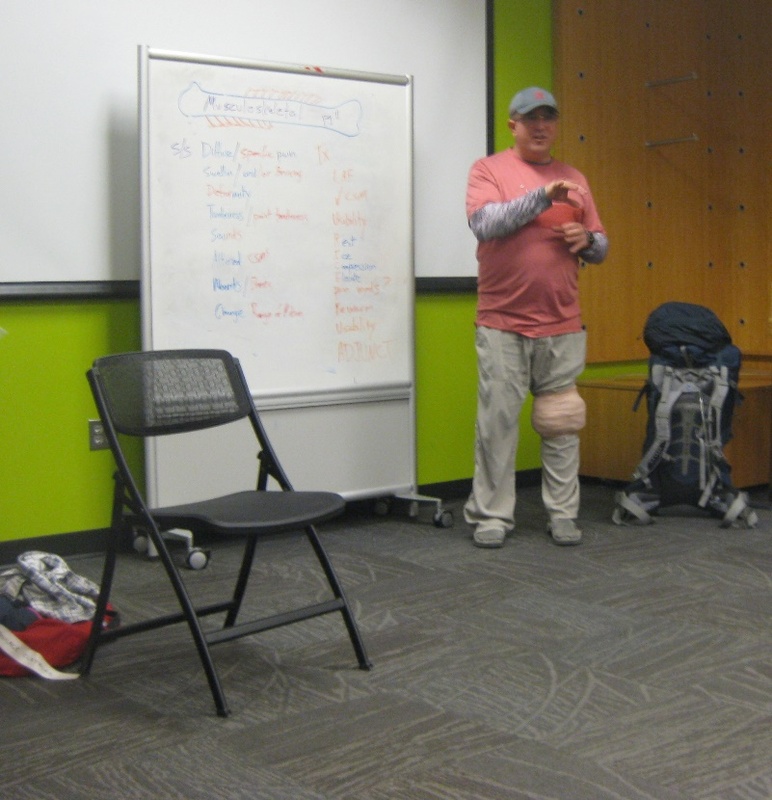 Students readily volunteered when the instructors needed a live "victim" to demonstrate solutions to particular medical challenges. Danny provided a rundown on musculoskelatal injuries and involved the class in discussing the treatment (Tx) for various common cases. His left knee is sporting a wrap that dealt with addressing a knee injury. Dan explained the key points of employing padding and compression which add up to the rigidity needed to protect fractures from further damage. 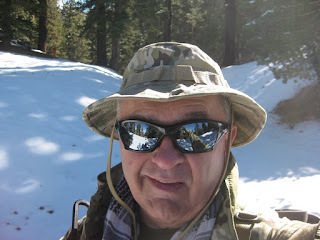 At various times my class roles included a head injury with mock blood dripping from my ear, Altitude Mountain Sickness effects on Mount Whitney or a broken leg due to a climbing accident. These are some of my fellow students brainstorming to quickly improvise a way to immobilize my leg "injury". All of these scenarios were timed in order to add some urgency to the situation..
Dan stopped by to inspect and approve their solution, bringing smiles to everyone's faces. 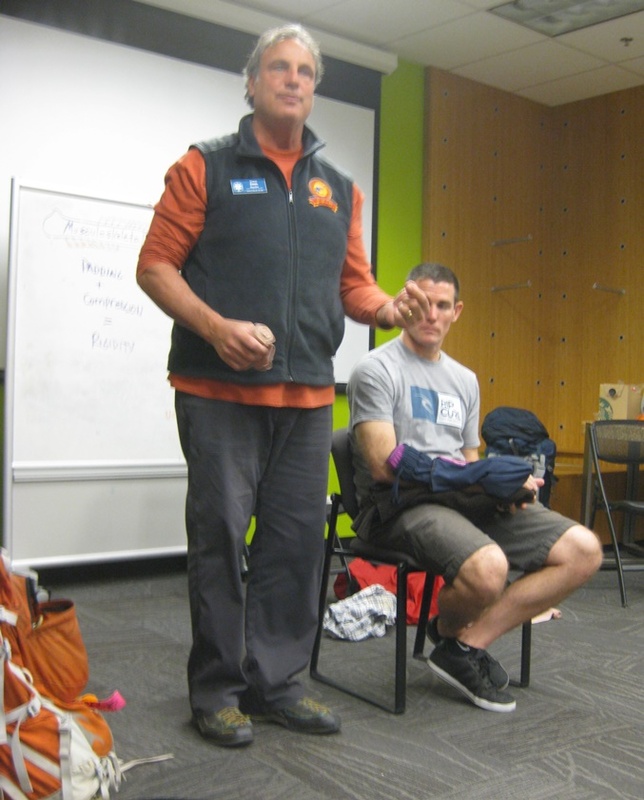 Here is Dan giving us pointers on dealing with arm fractures. 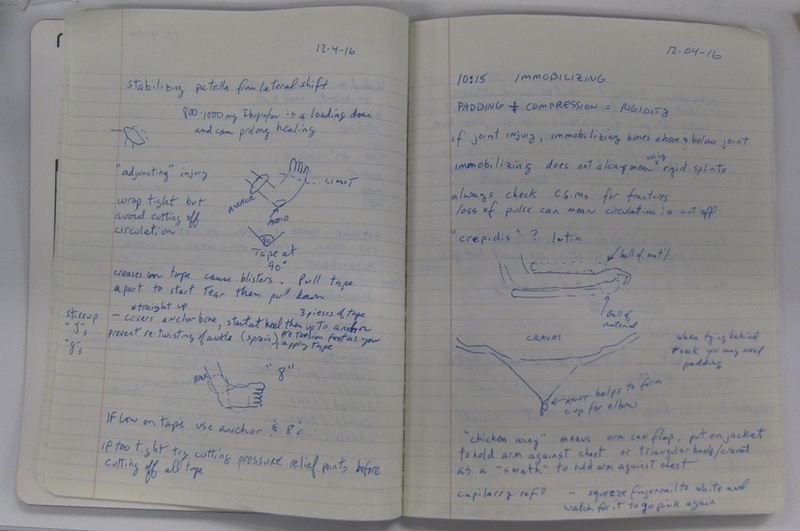 He followed this with demonstrating how to employ material at hand as well as the common shortfalls of commercial foam and wire splints. 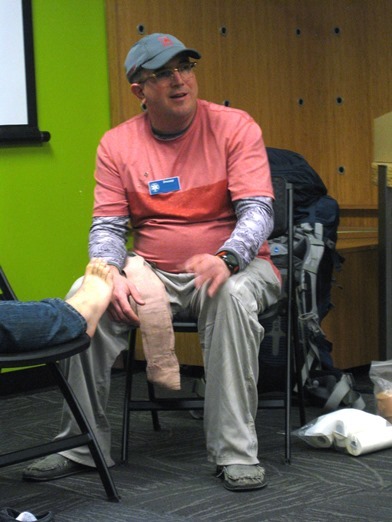 Another eye opening lecture and hands-on exercise revolved around foot injuries. I was very impressed with the wrapping techniques that employed adhesive cloth tape to stabilize an injured foot. 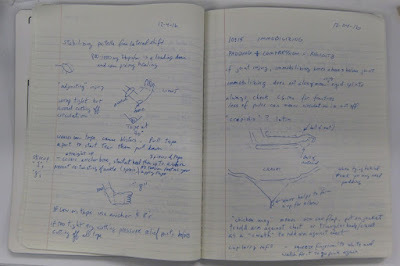 To add to the class handouts I took twenty-three pages of notes and included quick sketches or items to follow up on. 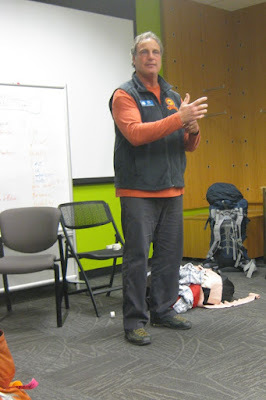 Each day left me tired but also quite wondrous at the door that I had just opened into the world of wilderness first aid. I cannot say too often that I am glad that I finally took this important step! You should take it too. 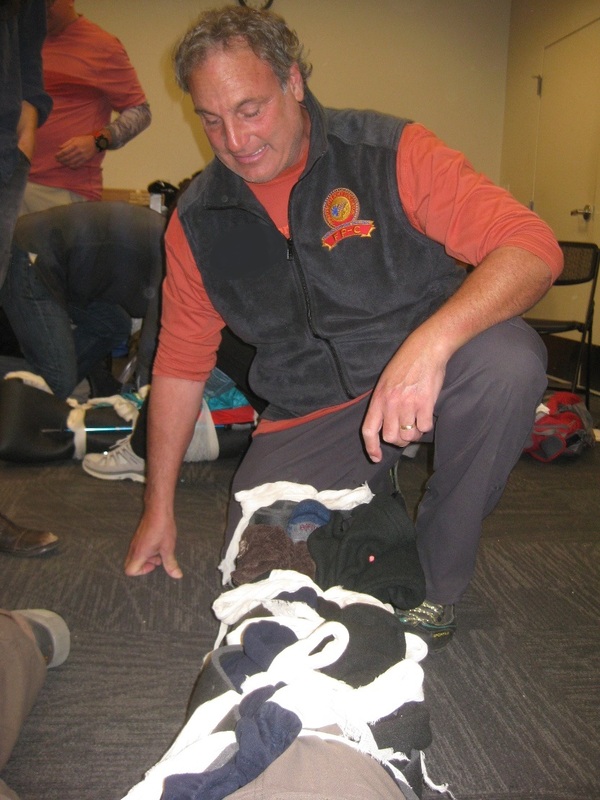 I hope that this brief article gives you a good idea of what you can gain from the WFA course. Whether you are in an urban or wilderness setting the course can give you the confidence to address traumatic, medical, and environmental emergencies. You want to prepare to act if an accident occurs because waiting too long may have unwanted consequences. Thanks for tagging along on this awesome classroom adventure! See you soon in the wide open spaces!